This is a great book! It is a small book but with a powerful message. 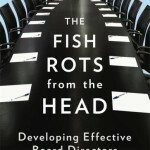 Essentially it says if the Board is dysfunctional then the rest of the organisation is dysfunctional. In other words, the rot starts at the top. “But I am a small business and I don’t have a board!” I hear you say. Over the years I have worked with many Boards and when you get it right, it is very powerful. A broad range of expertise with the right values all working for the benefit of the business or enterprise. When you get it wrong with personal agendas, or positions, limited or specific expertise, then it rapidly is reflected throughout the organisation. Some time ago, I worked with a Board that was polarised, could not agree on the direction, had differing agendas and limited expertise. The outcome was inevitable which was the demise of the organisation. If you get the Board right, there is a high probability that the organisation will be right and will grow and prosper. Remember, a fish always rots from the head. You CAN have your own ‘Advisory Board’. In Business Owners Board (bob) Groups there are no competing businesses so members can explore and work on ideas openly and honestly. There is a great mix of knowledge, expertise and experience. Members are challenged and kept accountable for growing their business. Expert speakers and members contribute ideas and work on issues to help everyone.